DISA Job Circular 2017- This NGO is recruiting manpower. It is a chance for you. A huge job seeker can apply here. It will be your great experience. So do not delay. Need huge manpower. The golden opportunity to build a career in microfinance activities. Disa means development initiative for social advancement. A development organization at a private level. The organization has been working in poverty alleviation for the last 24 years. They are also conducting developmental activities. The company is currently working in 20 districts. Apart from this, different organizations are cooperating. Various projects are implemented through other development partner organizations. You can see detailed information including post name, age, education and experience. Interested candidates will have to send the national ID card along with certified certificates of educational qualification to the following address. All the information of Bangladesh NGO job circular 2017 is available here. Besides, government and non-government job circular will find in job circular.info. You can send an application form via email. There may be a need for a motorcycle to run in certain positions. The cost of the motorcycle will be borne by the authorities. In some cases, the experience is needed. On the other hand, inexperienced candidates are given employment opportunities. Selected candidates must submit their previous employment certificate. The same application applies for all positions. However, if there is an interest in a particular post, it may be mentioned in the application. Above all, you can visit the official website that is http://www.disabd.org/. The institution wants to ensure the accommodation and food security. One of the objectives of this organization is to eliminate poverty. This will be possible only when everyone is guaranteed to work. These NGOs are working to deal with the unemployed youth and youth. The main focus of the rural poor population. Apart from this, the organization is working to be a proud partner of the overall development of the country. In fact, human resource is one of the main assets of Bangladesh. Bangladesh has enough opportunities to become a developed country. Here are adequate resources in Bangladesh. According to the plan, these resources must be applied in the work. Among them, education, agriculture, health, and human resources are one of them. DISA has been playing a leading role in the economic and social development for disadvantaged and poor people. DISA almost success to prevent poverty. But there are still lots of improvements. There needed a lot of manpower to handle the above-mentioned activities. You should match your eligibility with the DISA job circular 2017. From now on your career may start the journey. Currently, this company is working in 20 districts of Bangladesh. This organization is about 24 years old. It is a long time. In fact, DISA is working for social development. It has a strategy to go ahead. Overall, it is working to fill-up vision. Nowadays, It’s a lot of experience. So, the choice is yours. Finally, if you want to be a member of DISA, grow yourself properly. Read DISA job circular 2017 carefully. If you wish, you will be able to get honorable positions. In this case, your complete preparations are urgent. You can contact with DISA. To get more information, visit the official website. First of all, go to DISA website and then click on the career/navigation bar. Otherwise, you will get vacancies and result in related information. 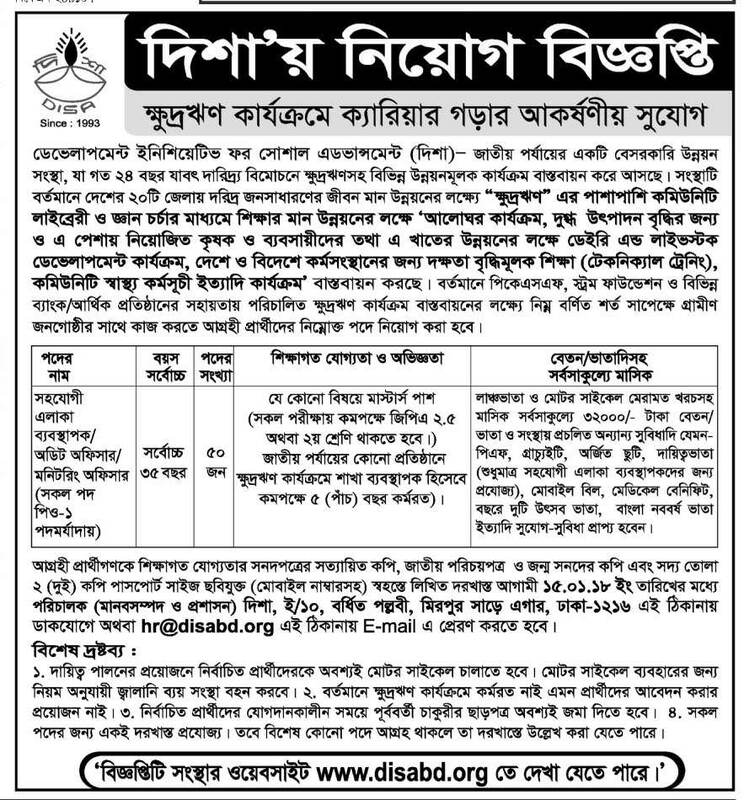 However, this job circular is a chance to build a career.